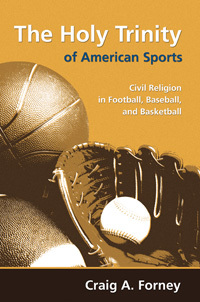 The Holy Trinity of American Sports explores how football, baseball, and basketball interact to illustrate civil religion in the United States. These three sports mark movement through one year in the country, providing extended seasons to supplement holidays like Memorial Day and the Fourth of July. Year after year, they generate ritual actions of daily, weekly, yearly, and once-in-a-lifetime significance. Football, baseball, and basketball portray three core stories of national worldview. Football depicts stories about the realities of life within history,while baseball expresses mythic aspiration for an ideal future. Basketball presents narrative of irreversible progress, story of fast-paced movement to highly productive conditions. Through stories of life, the three games convey doctrines about the source of truth, where to find knowledge of truths, and how to solve problems. Beyond doctrinal convictions, they disclose ethical beliefs of the nation for the worst, best, and most common situations. Functioning as a unit, the sports trinity communicates commitments to certain social arrangements, offering directives for interaction with people outside and inside the country.Football, baseball, and basketball possess great importance in the United States because they provide comprehensive and detailed illustration of American beliefs.